Attending the RCN Bulletin jobs fair in Manchester in February, Kellyann Anderton-Kay got much more than she had anticipated. ‘I’d expected to come away with a few leaflets, business cards and some pens, but I ended up being offered a job,’ says Ms Anderton-Kay, who qualified as a mental health nurse in April. ‘I decided I wanted to be a nurse when I was eight,’ she says. ‘But I got married at 20 and had a family not long afterwards.’ After a spell working in retail, she became a cleaner at Royal Bolton Hospital in 2008, continuing to work while studying for her nursing degree, which she started in 2013 at Salford University. As a nursing student she had enjoyed a placement with child and adolescent mental health services (CAMHS) best of all, so was ideally looking for a role in this specialty. ‘Although at just four weeks, it was one of the shorter placements, its impact lasted throughout my training,’ says Ms Anderton-Kay. At the jobs fair, her dyed blue hair helped to get her noticed by one of the companies recruiting that day. ‘Someone grabbed me and asked if I wanted to work in CAMHS, and I said that's exactly why I’m here. It was meant to be,’ she says. 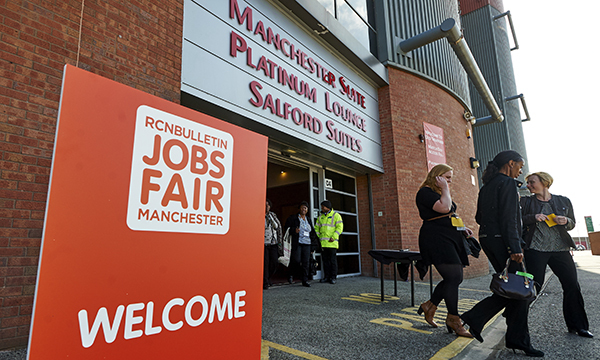 For more information about the RCN Bulletin Jobs Fair, including the seminar programme and a full list of exhibitors at the event, visit the jobs fair website here.